Castles & Crusades, The Crusader Magazine, Aihrde, and all other things SIEGE. 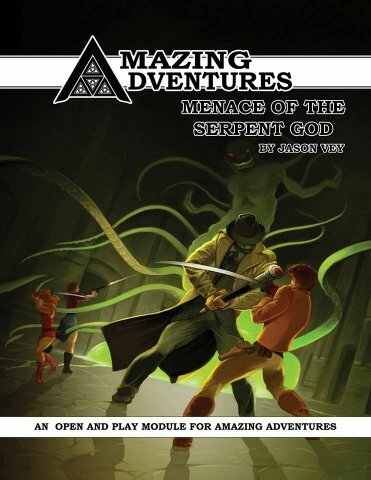 Amazing Adventures is Pulp Role Playing: Hard-boiled detectives, fedora-wearing action heroes, and steampunk gadgeteers rocketing to battle . . . . The year is 1939, and the Brotherhood of William St. John faces a dark new decade. With war raging in Europe and Asia, the time is ripe for their enemies, the criminal empire known as the Order of the Black Dragon, to appear once again...and appear they do. The feared leader of the Order, the mysterious Doctor Serpent, has a new plan to call upon the ancient serpent god Yig and absorb its power. If Doctor Serpent succeeds, it will bring a new era of darkness into the world, over which the Order of the Black Dragon will rule, with Doctor Serpent as a god-monarch at the top of the pyramid. The Brotherhood of William St. John has something to say about that, however, and it's a race against the clock to stop Doctor Serpent's dark ritual, before darkness covers the entire world. You are the Brotherhood. Can you stop Doctor Serpent in Time? This Open and Play adventure for the Amazing Adventures RPG includes all the rules you need to play, and an exciting and action-packed adventure, including six pre-generated heroes, ready to go. Using the acclaimed SIEGE Engine rules that power Castles & Crusades, everything you need to play is right here!